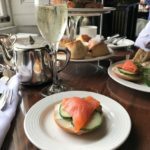 Wynyard Hall is probably one of the most beautiful settings in the North East, so before we’d even sat down I knew the Afternoon Tea would be an impressive experience. The Hall is mesmerising, grand and intricate from floor to ceiling. It’s really quite lovely just to sit in the venue and watch the world go by. However, on this occasion we were starving and highly anticipating the culinary delights awaiting us. We arrived early for our booking (yes, for once I was actually early), so our table wasn’t quite ready. 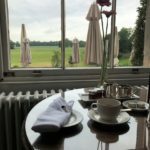 We didn’t mind waiting at all but the staff were accommodating, did a little bit of shuffling and seated us at a stunning window table with a view of the grounds. 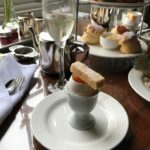 Our party was presented with a menu describing the several different Afternoon Tea variations, including a Gentleman’s Tea that included a glass of fine whisky and options that were served with prosecco and champagne. There was also an impressive menu depicting the huge range of handpicked teas available. All the tea is loose leaf and refillable throughout your sitting – the coffee too! 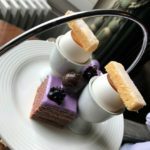 We were asked if we had any dietary requirements, and it was obvious that they went to maximum effort to cater for everyone. 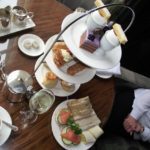 Gladly, we didn’t and our Afternoon Tea arrived very promptly looking absolutely delightful. 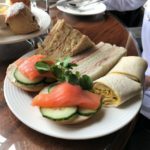 The savoury elements were egg and watercress sandwich, honey roast Yorkshire ham, a coronation chicken wrap and, my favourite, the smoked salmon and cream cheese bagel. All of the choices were fresh, with fluffy bread and an appropriate amount of filling. It was apparent that much thought gone into not only the presentation, but the choice of ingredients used for their food too. To accompany, we had fruit and plain scones with clotted cream and fruity jam. They arrived warm and glazed to perfection. Again, even the jam was sourced to ensure the best possible produce was on the table. Finally, we had a glorious selection of cakes and delicate pastries. There was a caramel éclair, pistachio cake and a chocolate and raspberry slice. The cakes weren’t outlined in the menu, so they may change from time to time. Each of the options were delicious, however they were completed overshadowed by the dippy egg number. 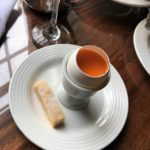 Yep, a dippy egg. But not as you know it. 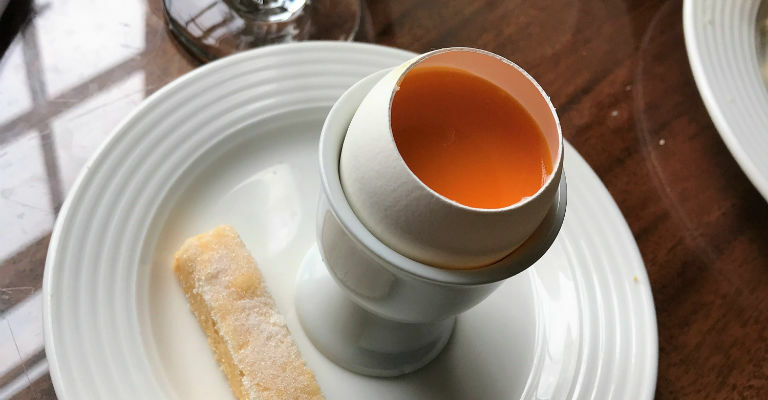 An egg shell filled with the most delicious mango parfait and a finger of shortbread for dipping. I could have quite happily sat and ate the mango out of a bucket, it was so refreshing and sweet, yet with a slight bitter tang to it. The shortbread was beautifully baked too. Not only was it a unique concept and a nice little novelty addition to our plates, but it was absolutely scrumptious. We were filled to the brim with cakey goodness, and still had a decent amount left to get through. Kindly, the staff at Wynyard Hall offered us some boxes to take home what we hadn’t managed to eat. For £22.50 per person, you get a considerable amount and a really tasty variation too. 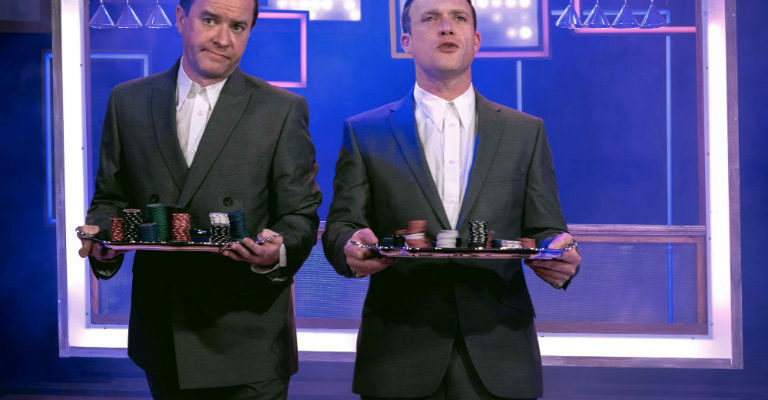 Plus the whole experience, (for me it was mainly pretending I was classy), is just quite nice. A quiet, serene environment with fine finger food made for a wonderful little afternoon. 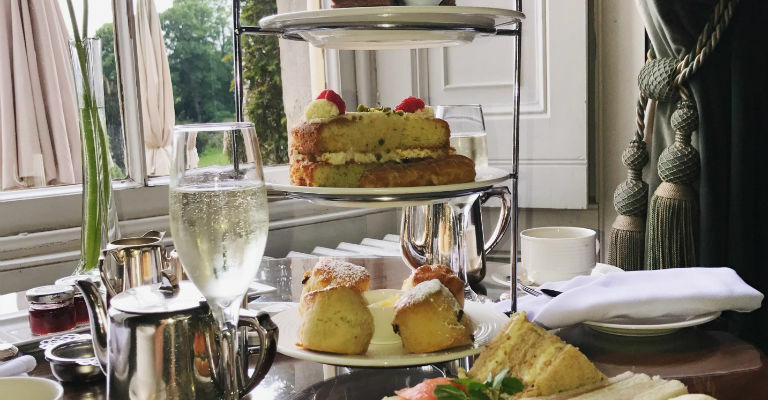 For more information on Wynyard Hall’s Afternoon Tea, visit their website. 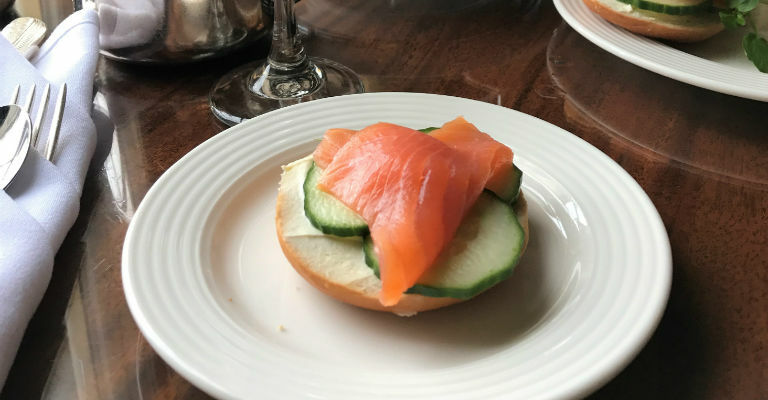 To see more of Laura’s food blogs, visit her website Proper Scrumptious, and check out more of her photography from the afternoon below.